Plastik. kaiščiai 10X160su DIN 571 varžtu įsuk. Kalamas medsraigtis SM 5x45 be bortelio 200 vnt. Kalamas medsraigtis SM 6x50 be bortelio 200 vnt. Kalamas medsraigtis SM 6x80 be bortelio 100 vnt. Pins - in this moment You are in this category. 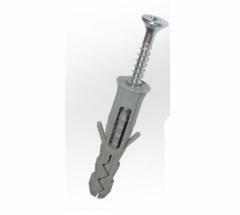 Pins • Fixing elements (roof, wall, plaster board and insulation materials) • Construction and building materials Price buying online in a group pins it’s a great choice for every client. There’s always a chance to get an item cheaper from a fixing elements (roof, wall, plaster board and insulation materials) group. Don’t be lazy to ask for a better price and if there’s a possibility our managers will offer you products from a pins group for a cheaper price.